Heavy change of the weather conditions im Imola over night lead to another exciting race on Sunday morning. The last race of the BOSS GP season 2017 brought another face on the P1 than Ingo Gerstls – young Dutch Rinus van Kalmthout won his second podium of the season. Just two OPEN class drivers were left in the start grid of the BOSS GP season final: Rinus van Kalmthout (Mansell Motorsport) and Phil Stratford (Penn Elcom Racing). Ingo Gerstl, who actually had secured his Championship title 2017 already a couple of races ago, stepped back from the race and didn’t compete. “There are technical issues related to these weather conditions. I don’t wanna risk driving the race without the necessary technical tests”, Gerstl told us. Phil Stratford drove a souveign rain-race as well and even managed to overtake FORMULA class driver Florian Schnitzebaumer after lap 3. The gap between van Kalmthout and Stratford indeed was 1:22,972 min, so P1 for the Dutch was never questioned. Finally Ingo Gerstl defended the BOSS GP Championship 2017 more than successful with eight P1 out of nine races and 200 points in total. A victory, that was never questioned. Runner up – in his first BOSS GP season and making his debut in this car – is Rinus van Kalmthout with a total of 116 points. He is followed from third ranked Phil Stratford with a total of 111 points. Find the full standings of the whole grid on our ranking table. 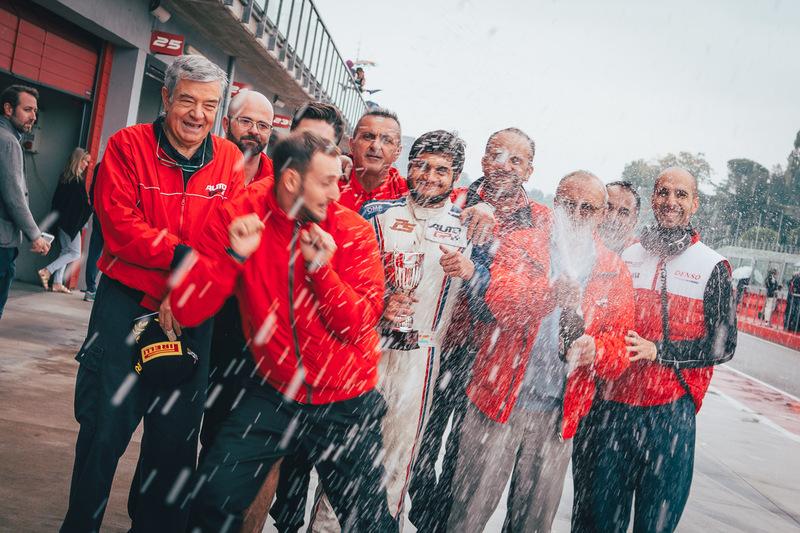 It was a golden weekend for Indian driver Mahaveer Raghunathan (PS Racing by Coloni Motorsport), who didn’t just win the race on Saturday in Imola, but also claimed the victory of the very last race of the season in Imola on Sunday again. With this result, Raghunathan not only won both races, but also the Championship 2017 of the BOSS GP FORMULA class. As already reported, former leader of the FORMULA class, Johann Ledermair (Ledermair Motorsport), had to cancel his participation of the two last season races due to technical problems on early Saturday morning, as well as PETER, who stepped back from both races as well due to technical issues. So a thrilling battle was left between local hero Salvatore De Plano (MM International Motorsport) and Raghunathan for the overall victory of this years Championship. 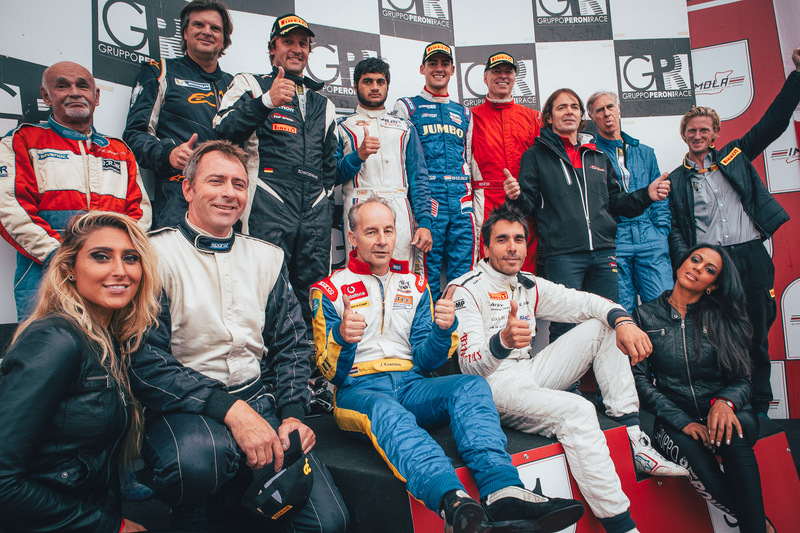 After winning season race 13 on Saturday in Imola, Raghunathan started the race on Sunday highly motivated again. Weather conditions in Imola had turned over completely during the night. So rainy, wet weather awaited the grid on the track. After two safety car laps the grid finally started into the race and was – despite the rain – on fire. 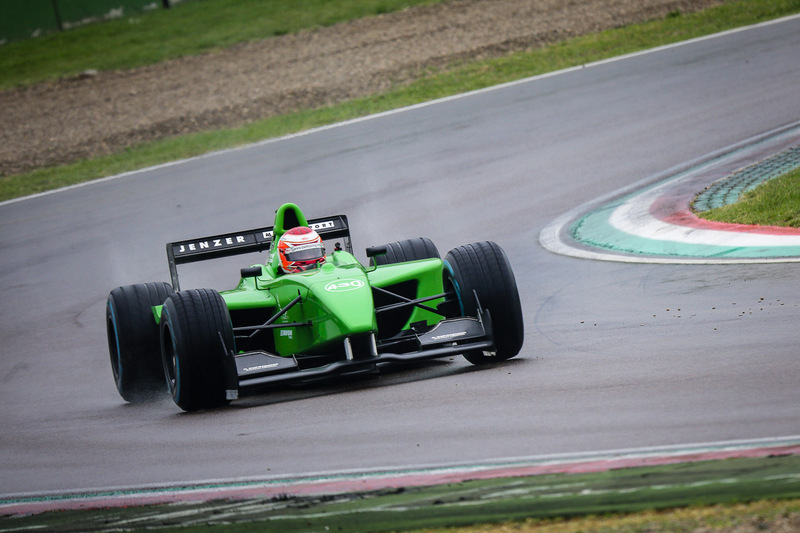 It was indeed not a good weekend for Salvatore De Plano (MM International Motorsport). The Italian, as well as Raghunathan, had good chances, to win the Championshiop after Ledermairs cancellation of the weekend. But De Plano dropped out of the track in the beginning of fourth lap, which meant – all Championship chances were gone for him. So it was Raghunathans – holding position 2 of the overall grid – turn, to bring this race home safely. Team “PS Racing by Coloni Motorsport” celebrating the Championship of Mahaveer Raghunathan. Due to ongoing rain, conditions for all drivers were challenging. “I liked the rain and the wet track”, Raghunathan indeed explained after the race. 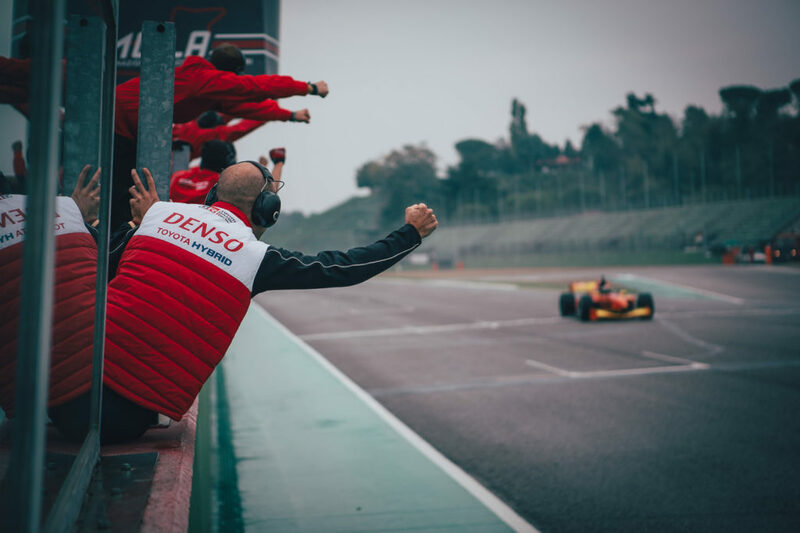 “I love driving during such weather conditions.” The Indian, well known as a good rain-driver, showed a souvereign performance and finally finished on first position of the FORMULA class. “I am really happy with that win and todays race. It was a lot of fun, and I’m absolutely happy, that I could make it P1 and finally the Championship as well. This is amazing. 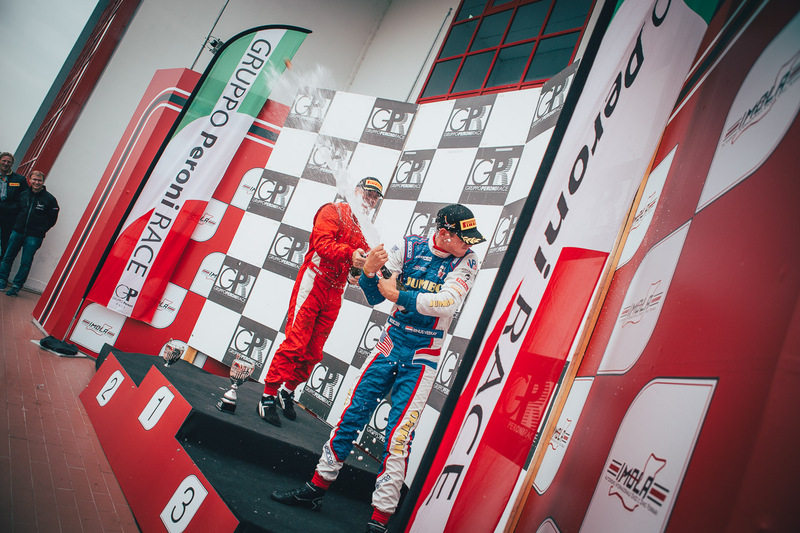 I want to give a huge thank you to my team at PS Racing by Coloni Motorsport, who did a great job”, Raghunathan said after the podium ceremony. Florian Schnitzenbaumer (Top Speed), having had some trouble at Saturday’s race, showed a great performance in Sunday’s race and secured P2. “I’m not really satisfied with my lap times today”, the German wasn’t totally happy despite his podium position. “It was not a good racing year for me at all. But I tick it off, next year will be better”, Schnitzenbaumer said. Martin Kindler racing to P3 in Imola 2017. Veteran Karl-Heinz Becker (Becker Motorsport), René Kouwenberg (De Boer Manx) and Nicolas Matile (PS Racing by Coloni Motorsport) completed the grid. Walter Steding (Inter Europol Competition), who seemed to race for his first season spot on the podium (P3) for a long time finally was disqualified for rule violation (passing through the pit lane) and turned into the box after nine laps, actually owning the P3 spot at this time of the race. Final of the season 2017. So in the end it is Mahaveer Raghunathan, who is the new Champion 2017 of the BOSS GP FORMULA class. The young Indian, who finished 2016 season on fifth place with a total of 118 points, performed a constant season 2017. 16 points separate Raghunathan from runner up Johann Ledermair, who finishes the season on second position. The gap to third ranked Salvatore De Plano is little: Ledermair leads over the Italian only by four points. Find the full standings of the whole grid on our ranking table.